Did you know the US Post Office will mail just about anything? Even Bunny Mail! While searching the easter section at Target I stumbled upon these cute little easter bunny eggs. They are sold in sets of two for about $4.00. I figured they were just the perfect size to mail a few sweet treats to my dear niece and nephew that live out of state. 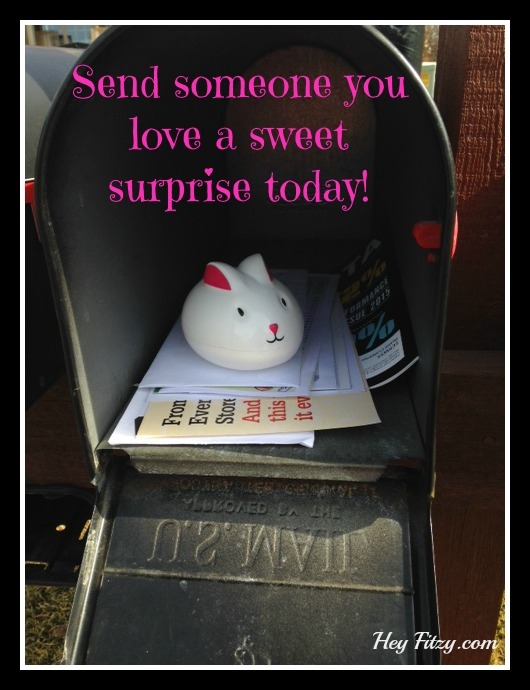 Imagine their surprise when they open the mail box to find a sweet little bunny looking back at them! 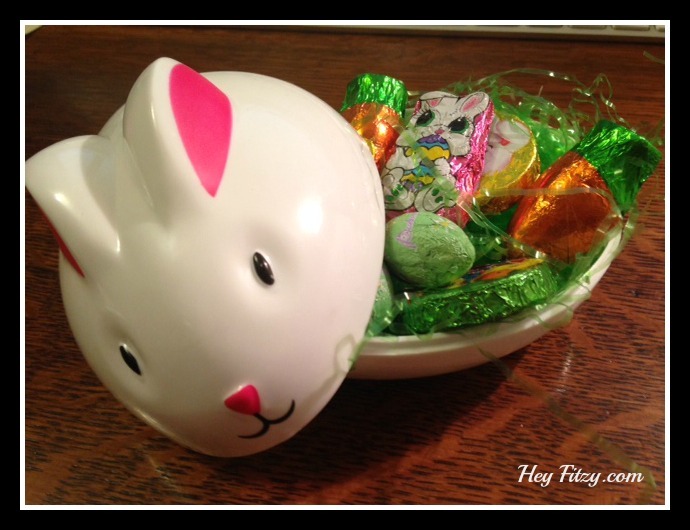 I filled mine with a little easter grass, a few small pieces of chocolate, and a small note. 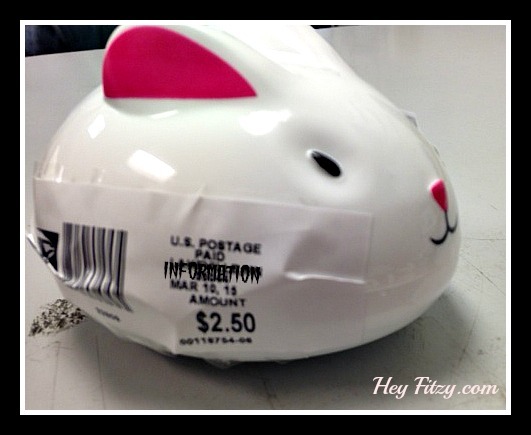 The bottom of the bunny is flat and just the right size for an address label. 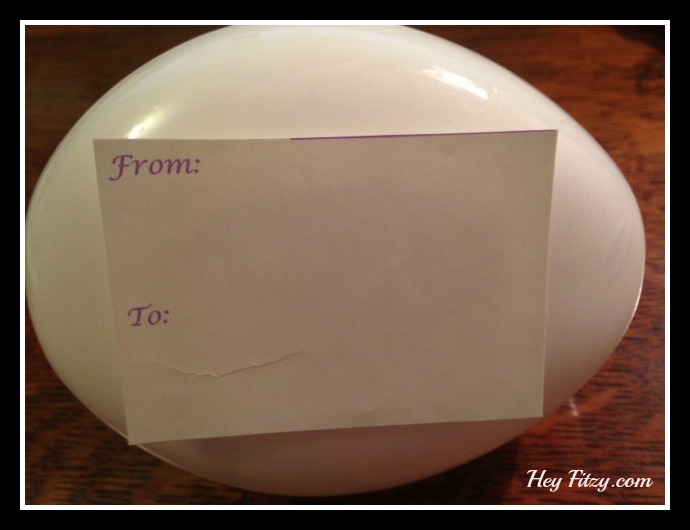 A little clear packing tape does just the trick to keep the egg sealed during shipping. When visiting the post office, the man behind the counter got a chuckle when he asked, “you want to mail it like this?”. 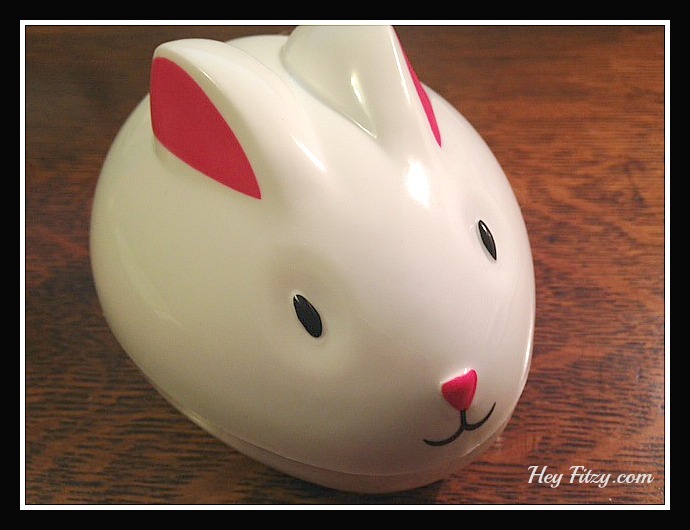 With a smile I replied, “yes please!” The postage sticker fits easily to one side of the bunny egg. Depending on the weight and where you want to send it, the cost was around $2.50 for shipping. So for less than $5.00 my niece and nephew are going to receive a fun little surprise in the mail. I wish I could see the look on their faces when their bunny arrives! Oh my heavens! I love this! Was it marketed as a 'mailable' thing or can you use just anything? Hi Lynn, It really is amazing what the post office will mail. I found these little bunnies at Target. They are easter eggs. I taped them shut and the post office put a label on them. My niece and nephew love to open up the mail box and find fun little goodies in there. Hi Jennie, Thank you for stopping by! I was a little shocked at first when I learned the post office will mail just about anything. It provides limitless ways to surprise loved ones! OMG, that is such a cute idea! Makes me want to mail some to my own house for my kids to receive. Sharing. Visiting from Inspire Me Monday party. Thank you Victoria! I bet your kids would love it!! In fact...you doesn't love receiving something fun in the mail!!! Hi Angie, Thank you for sharing that sweet story. I always think of the delight my recipient will have when receiving the little treasure but never imagined it may also brighten the mailman's day. Makes it even better. Thank you for stopping by! Hi Emily, Thank you for stopping by! I continue to be amazed at what the post office will deliver. It is so fun sending these delightful little treasures!! Didn't know the post office would ship something like that! What a cute package to receive. Thanks for the idea and for linking up with Funtastic Friday! Hi Heidi, Thank you for stopping by. It really is amazing what the post office will ship. I love sending these fun little packages!